1796-9, possibly by Thomas Rudyerd. 3 storeys and basement to front, 6 storeys to rear, 12-bay E-plan former barracks. Advanced bays to ends and advanced pedimented bay to centre. Coursed sandstone with polished dressings. Cill band to 1st floor; bracketed eaves course and parapet. Regularly fenestrated. Flat-roofed 2-bay porch with Doric columns to centre, single-bay porches to ends. Piend-roofed dormers to attic. Balustrade to basement area. Arcade, previously open, now with iron verandah (1893) at 1st floor to rear. Predominantly 12-pane glazing in timber sash and case windows. Grey slates. Broad ashlar ridge and end stacks. 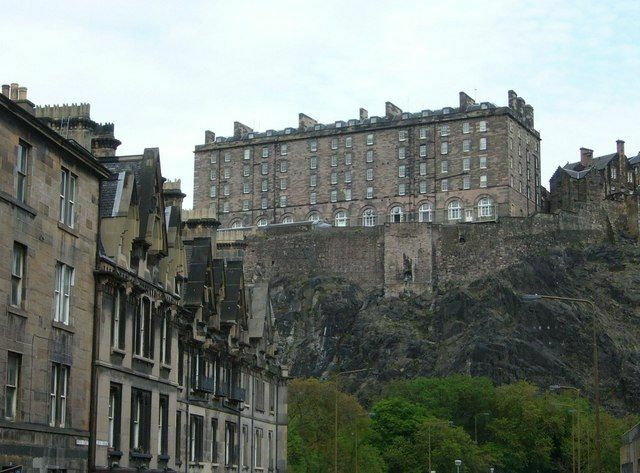 The A Group comprises Batteries, Foog's Gate, Gatehouse, Governor's House, Great Hall, Lang Stairs, Military Prison, National War Museum, New Barracks, Old Guardhouse, Palace Block, Portcullis Gate, St Margaret's Chapel, Scottish National War Memorial, Telephone Kiosks, United Services Museum and Vaults, all within Edinburgh Castle, and in the Care of Historic Scotland. Built during the war with Revolutionary France to provided accommodation for an infantry battalion, 600 officers and men. The articles in the BUILDER and BUILDING NEWS describe a scheme by Billings to Baronialise the building, breaking up its monolithic appearance from the N and giving it an appearance of the James VI Palace block to S. Both articles state that the Barracks had been 'dismantled' 6 years previously, prior to the erection of a garrison church, and that this order had been 'countermanded,' and the building left 'in a ruinous state.' Although Billings worked on carvings for the building, his scheme was not executed, and the Barracks were apparently rebuilt in approximately the previous form. An architectural model now in the Argyle Tower shows a different scheme.